Does Meditation help High Blood Pressure? High blood pressure, also known as hypertension, is the heightened pressure of the blood that is pumped through the arteries. This condition usually has no warning symptoms or signs. People typically do not even notice that they already have the condition. Over the course of a prolonged period, the constant increased pressure can cause accumulated damage that manifests first in your circulatory system then spreads to the rest of your body parts. Fortunately, there are ways to help regulate this problem. One of this involves meditation. Hypertension is a condition that is beyond the 120 over 800 mmHg mark. Anything beyond that sphygmomanometer reading can be considered as pre-hypertensive. The “actual” high blood pressure is considered at least 140 over 90 millimeters of mercury. One of the most common causes of hypertension is stress. However, it can just manifest on its own or may arise from certain conditions such as kidney problems and family history of high blood pressure. Some risk factors that can predispose you to have hypertension include existing health problems, gender, weight in relation to height, ethnicity, and age. Other factors that can contribute to hypertension include medications, tobacco use, alcohol use, low-potassium diet, a sodium-abundant diet that can be attributed to fatty and processed foods, and a sedentary lifestyle. There is an important mechanism at play so meditation can work against hypertension. When your body is under stress, your hormone levels go haywire in an attempt to balance out everything. When this happens, you will then unknowingly resort to coping mechanisms like binge eating, alcohol use, and poor sleeping habits, just to name a few problems. Mediation works to counteract this problem by placing you in a relaxed state. When your body is relaxed, it makes it easier for the endocrine system to “figure out” what went wrong with the hormone levels. It then adjusts accordingly to the changes. There are numerous benefits that you can enjoy from practicing meditation. This helps improve the immune system functions. It aids in enhancing your cardiovascular health. It keeps you happy most of the time. It also improves self-acceptance and self-love. This activity encourages you to practice a healthy lifestyle. It increases your concentration levels. It helps reduce stress levels, thereby reducing your blood pressure as well. 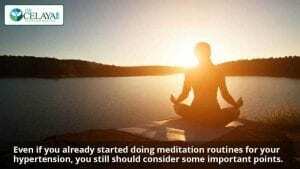 You can do various types of meditation activities if you plan to do this on a long-term basis. Unlike popular belief, meditation activities should not only be composed of activities that require sitting still and closing your eyes while letting your mind unravel before you. There are other fun mindfulness activities that you may try out if you want to explore some more. Worksheets, when used in conjunction with other techniques, are also great ways to improve not only your state of mind but also visual learning. DBT, also known as Dialectical Behavioral Therapy, is also a good way to help improve your mindfulness. 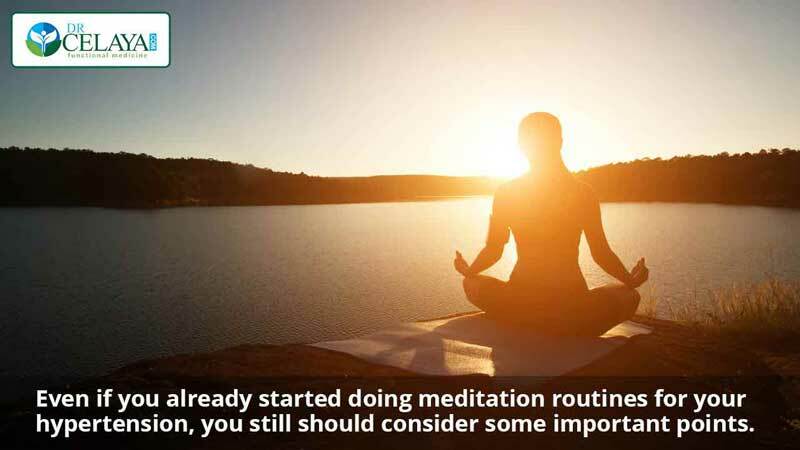 You can apply different tips to further improve your meditation experience. Open your eyes as gently and as slowly as possible. Start with some warm-up activities like thinking about a single calming subject at a time. As much as possible, make sure you’re not too full or not too hungry before you begin the exercises. Sit with a comfortable posture but do not slouch. Select a quiet place where you can regularly meditate. Set a convenient time every day. If you are already doing advanced meditation, you may opt not to close your eyes and just focus on any distant object. If sitting still is a problem for you at the moment, you may do it while walking. Research shows that meditation indeed helps in lowering one’s blood pressure. An overview of meta-analyses and systematic reviews showed that meditation can help in safely lowering a person’s blood pressure. Specifically, the studies that are placed under scrutiny focused more on transcendental meditation. This is a type of technique that helps reduce stress by about 2 to 4 mmHg when performed correctly. Another research that tackled the benefits of meditation includes a randomized controlled trial that lasted about 8 weeks. Wearable tracking device and smartphone use along with meditation and diet management application can help in lowering blood pressure. This is provided that the respondents closely adhere to the intervention. Even if you already started doing meditation routines for your hypertension, you still should consider some important points. While meditation can promote a better blood pressure level for you, this does not mean that you should solely rely on it for your management. Hypertension is a systemic problem. Therefore, you should make sure that you will cater to other services to help care for your entire body and not just the circulatory system. This means that you should still take care of your hypertensive medications, resort to a balanced diet, and perform exercises on a regular basis. Deficiencies in nutrients such as biotin, vitamin D, vitamin C, B1, choline, magnesium and CoQ10. Appropriate management of a thyroid condition such as autoimmune Hashimoto’s hypothyroidism can normalize blood pressure. A lack of dietary potassium and too much sodium. Balancing these nutrients can help balance blood pressure. Many people are deficient in magnesium, this is a problem because it can help relax the blood vessels. Elevated blood sugar and metabolic syndrome which is pre-diabetes are related to hypertension. Hormonal imbalances, such as an estrogen deficiency, can lead to high blood pressure. 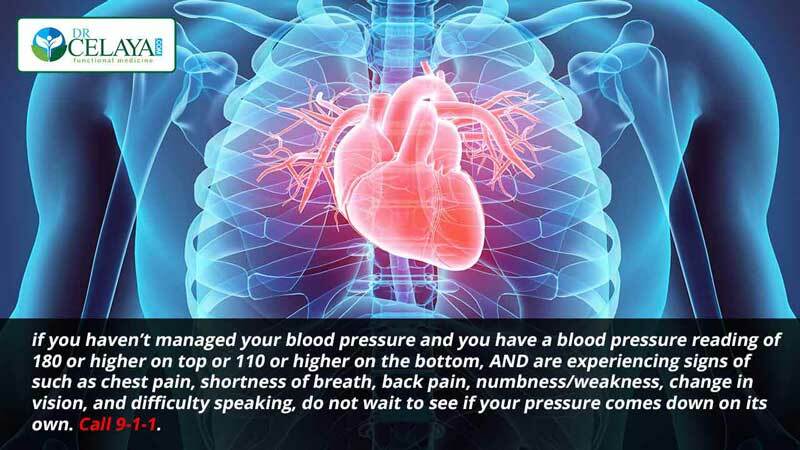 Now if you haven’t managed your blood pressure and you have a blood pressure reading of 180 or higher on top or 110 or higher on the bottom, AND are experiencing signs of such as chest pain, shortness of breath, back pain, numbness/weakness, change in vision, and difficulty speaking, do not wait to see if your pressure comes down on its own. Call 9-1-1. To know more about some other management techniques that you can do to address hypertension, sign up for a free consultation or become a new patient.